Home Automation 2.0: What Everybody Should Know! Have you heard about HA 2.0? The failure of HA 1.0 to capture people’s imagination has been attributed to a number of reasons. 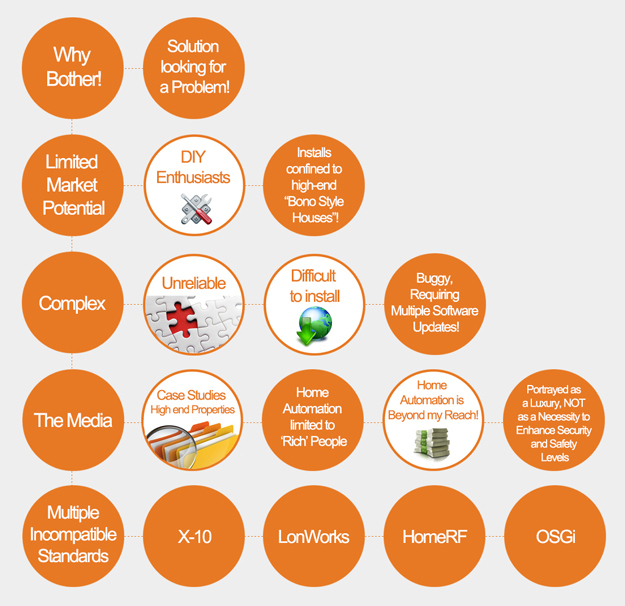 Complexity – Many of the HA 1.0 products released in the early years of home automation were buggy and technically complex. Multiple incompatible standards – Over the years there have been attempts by various organizations to create standards to drive the adoption of home automation systems across the globe. Poor interoperability of devices from different suppliers and limited support from the manufacturing community has kept penetration of HA 1.0 products to a minimum. Expensive to install – Although HA 1.0 did provided for DIY type products, in general an end-to-end home automation system required expensive install professionals to ensure that the equipment worked correctly. Incorporating a full home automation system into a new house required a significant upfront investment. The media – Coverage of home automation 1.0 systems was typically confined to case studies of large high-end ‘Bono style’ houses owned by celebrities, or demonstrations of futuristic smart homes. This approach has embellished the belief in most people’s minds that home automation is not affordable and is only available to affluent people in our society. A solution looking for a problem – HA 1.0 solutions were nice to have; but did not solve any specific problem for consumers around the globe. Limited to DIY enthusiasts and high-end properties – The HA 1.0 market is quite small and limited to people who install automation in their homes as a hobby, and to systems that get installed by professional home integration experts. Today, user perceptions towards home automation have begun to change. People are starting to learn about the possibilities of using their smartphones or tablets to control their homes. The latest generation of automation, dubbed home automation 2.0 (HA 2.0) is changing the way the average person thinks about controlling their home. HA 2.0 refers to the ability to use a device such as a standard remote control, a smartphone, tablet, or PC to control particular life enhancement systems within your home. Examples of critical systems you might want to control from anywhere in the world include lighting, heating, alarm, and cameras. The term often means different things to different people; some people think of HA 2.0 as a system that allows them to turn their heating and lights on from their smartphonewhilst on the way home from work, whereas others define an HA 2.0 system as a means of cutting down on energy costs. What it means in reality is that home automation solutions have reached a stage in their evolution, where it has finally become affordable for the ‘man on the street’ – no longer is home automation confined to the privileged in society! Almost daily, we hear of new and innovative home automation products being launched onto the marketplace from a diverse range of stakeholders. As you can see from the above diagram HA 2.0 is on the way; however, in order for HA 2.0 to achieve mass market uptake, closer cooperation between all of these stakeholders will be required over the coming years. Standardization has happened! – Global standards, protocols, and data distribution systems are available, which allow home automation control structures such as security and lighting systems to interact and integrate with each other. The Internet – The wide adoption of the Internet has resulted in the growth and advancement of HA 2.0. Users can activate an App running on their smartphone or tablet device to remotely access their surveillance cameras, adjust home lights, turn up the air conditioning or close their curtains from anywhere in the world. Proliferation of mobile devices such as smartphones and tablets: The near-ubiquitous ownership of smartphones is driving demand for Apps that allow consumers to monitor and control their alarm, lighting, heating, cameras and entertainment systems remotely over the Internet. Awareness that these devices can be used to control all of these in-home systems is starting to slowly creep into society. Availability of Affordable HA 2.0 products: Most HA 2.0 products do not require professional installation and are pretty affordable to buy. Low cost products based on mature technologies such as Z-Wave, Zigbee, INSTEON and Wi-Fi has eliminated the pre-requisite of re-wiring a house to install an automation system. Much more than the cool factor: Not only is App control of a person’s home considered to be cool, but HA 2.0 products can help to enhance living standards, increase home security levels and cut down on energy expenses. Major service providers are reselling HA 2.0 home monitoring products to their customers – Cable operators, telecom companies, large international home security companies are looking for new growth opportunities and have started to offer home control and alarm subscription products to their existing base of customers. Government Initiatives – Governments around the world, including our own here in Ireland, are encouraging the adoption of smart grid technologies in order to reduce household energy consumption. HA 2.0 products such as appliance control modules, automated light switches, and smart thermostats are viewed by most as valued additions to these initiatives. Expectations are growing! – People’s expectations are growing from generation to generation. In addition to basic telephone and TV services enjoyed by our parents, younger people nowadays (such as myself J) want features such as HDTV, multi-room music, surround sound and IP cameras included in their homes. It’s simple to use: Once installed, a HA 2.0 system provides easy control of all your lights, heating, security and entertainment systems via a tablet, smartphone or PC. Improved comfort & convenience: HA 2.0 systems allow you to setup ‘scenes’ that will increase comfort levels at home. Scenes are normally used to perform a number of actions at a particular instance in time. For instance, I have an ‘ALL OFF’ scene on my Smartphone that switches all of the lights OFF around the house – it’s handier than jumping out of a warm bed on a cold Irish winter’s night and turning off the light in the bathroom, which was left on by one of our kidsJ the boiler to increase temperature levels around the house. Receive an instant alert via text message or email that your house is under attack from intruders. Receive live video feeds from an IP camera(s) located inside or outside the house to your smartphone. When the smoke detector is activated then selected lights around the house will automatically turn on. Save money: I knew this one would grab your attention L. There is a perception out there that ‘fancy’ automation systems cost a fortune, where in reality these systems are very affordable and can in fact save you some money. Once installed and configured a HA 2.0 system helps you to save on your monthly electricity, gas, and water bills. In addition to saving money, the implementation of a HA 2.0 system also indirectly contributes a little to improving the environment. Increase house value: An easy and engaging way to add value to your home and increase its resale appeal is to upgrade with a HA 2.0 system. Reduced energy costs and high security levels appeal to tech savvy professional house buyers. The addition of a HA 2.0 system to a property helps to make your home stand out from other ‘for sale’ houses in the area. It’s fun and provides the Wow factor: There is some really cool stuff you can do with a HA 2.0 system. Not only will you enjoy messing around with it yourself but it also creates the wow effect for neighbors and friends. Applies to all home sizes: A HA 2.0 system can be used in all household types ranging from a single bedroom apartment, up to a 2,000 square foot detached house and larger if you’re rich. The Peace of Mind Feeling: Have you ever left the house in a hurry and had this uneasy feeling that you forgot to turn off the lights or indeed lock the door after you – not a nice feeling and puts an element of doubt in your mind. HA 2.0 solves this problem by allowing you to use your smartphone to check the status of the door lock and lights around the house, without having to drive all the way back home. Ready to take the next step! Click here for some free video training modules. Founder of HomeMentors.com, author of various books including Manage Your Home with a Smartphone App! If you you’re ready to start building a next generation home automation system to enhance your family’s safety, security and enjoyment, then why now check out my Free Video Training Series.